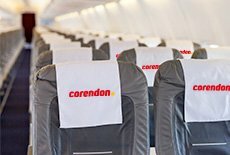 If you book your flight at www.corendon.com or by telephone at the Contact Center, you can book your baggage at the same time. If you want to add baggage at a later date, you can do this online 6 weeks until 5 hours prior to departure at fly.corendon.com. If you want to add baggage closer than 5 hours to departure, this can only be arranged at your departure airport. Please note that rates at the airport are higher. Luggage may be no higher than 89 cm and no wider than 115 cm. This because of the size of the door of the overhead compartment. Click here to see rates for unusual baggage. Every person is allowed 1 piece of carry-on luggage weighing up to 7 kg (maximum dimensions 55 x 35 x 25 cm.) NB: everything must fit into 1 piece of carry-on luggage, including laptops, purses, etc. Inflatable objects, including inflatable balls for athletic purposes, such as footballs, are not allowed on board. In case of questions regarding baggage regulations, please consult our Frequently Asked Questions. You can purchase additional checked luggage from Corendon on departure from and arrival at a Dutch airport. The same does not apply to departure and arrival from German airports where you are allowed up to 20 kg of checked luggage per person free of charge. We recommend booking and paying for your checked baggage when you make your flight reservation, because rates for additional baggage are higher at the airport. Every item must weigh less than 32 kg. For destinations Banjul and Dubai, a maximum of 20 kg per person is allowed. Excess baggage is not allowed. If you purchased additional baggage in advance, but have even more baggage with you when you check it at the airport, you will be charged the difference with the airport rate plus € 15. You can purchase additional checked baggage from Corendon on departure from and arrival at a Belgian airport. This does not apply to departure and arrival from German airports, where you are allowed up to 20 kg of checked baggage per person free of charge. We recommend booking and paying for checked baggage at the same time as your flight reservations, because the rates for additional baggage are higher at the airport. * These options do not apply to Banjul and Dubai. 1 piece of luggage may weigh up to 32 kg. If you arrive at the airport with more luggage than you paid for in advance, you will pay € 7 per kilo of excess weight. Baggage may reach a total maximum of 50 kg per person. You are allowed 1 item of carry-on luggage per person, up to a maximum weight of 10 kg (maximum dimensions 55 x 35 x 25). This includes laptops, photo and film equipment. In addition, 1 coat or bag with items purchased at the airport after security/custom control is allowed. Checked baggage can be purchased online at www.transavia.nl. Use your 7 digit Corendon reservation number. You can purchase extra checked baggage 6 weeks to 4 hours prior to departure. If you are making your reservation less than 3 weeks prior to departure, you can purchase extra baggage the following day. Maximum 32 kg per luggage item and maximum 50 kg per person. Maximum 5 items per person. If you arrive at the airport with more luggage than you paid for in advance, you will be charged € 15 per 5 kilos of excess weight. Baggage may not exceed a total maximum of 50 kg per person. *No more than 32 kg per luggage item and no more than 50 kg per person. No more than 5 items per person. For all other baggage, please consult the KLM Baggage Requirements. I am going on a return trip with Corendon Airlines and/or Corendon Dutch Airlines. How do I purchase additional checked baggage? You can purchase your checked baggage immediately during the reservation process at www.corendon.nl, or by telephone at the Contact Center. At a later date, you can also purchase additional checked baggage online fly.corendon.com starting at 6 weeks prior to departure. You will not be issued a voucher. Your baggage reservation is automatically processed by the check-in system. We do recommend printing your proof of payment and bringing it with you to the airport. I am flying with Corendon Airlines or Corendon Dutch Airlines and have purchased checked baggage. How does this work? You will not be issued a voucher. Your baggage reservation is automatically processed by the check-in system. We do recommend printing your proof of payment and bringing it with you to the airport. My departure and return flights are booked with different airlines. How do I make baggage reservations? Please note that every airline has its own baggage rules. For example, if you are flying to your destination with Corendon Airlines and your return flight is with Transavia, you must reserve your baggage on the respective websites. I am flying with Transavia. What are the baggage regulations? You can purchase checked baggage at www.transavia.nl. Use your 7 digit Corendon reservation number. I am flying with Emirates to Sri Lanka. What are the baggage regulations? You are allowed up to 30 kg checked baggage and 7 kg carry-on baggage free of charge if you booked a package tour with Corendon. Please consult theEmirates baggage rules. I am flying with KLM to Bali or Curaçao. What are the baggage regulations? You are allowed up to 23 kg checked baggage and 12 kg carry-on baggage free of charge if you booked a package tour with Corendon. Please consult the KLM baggage rules. I am flying with Air Berlin to Curaçao. What are the baggage regulations? You are allowed up to 23 kg checked baggage and 8 kg carry-on baggage free of charge if you booked a package tour with Corendon. Please consult the Air Berlin baggage rules. I am flying with Vueling. What are the baggage regulations? You are allowed up to 7 kg of carry-on luggage free of charge if you booked a package tour with Corendon. Please consult Vueling baggage rules. I am flying with Nesma Airlines to Egypte (Hurghada). What are the baggage regulations? You are allowed up to 20 kg checked baggage and 5 kg carry-on baggage free of charge if you booked a package tour with Corendon. I am flying with Brussels Airlines to a destination other than Gambia/Banjul. What are the baggage requirements? You are allowed up to 20 kg checked baggage and 12 kg carry-on baggage free of charge if you booked a package tour with Corendon. Please consult the Brussels Airlines baggage rules. Every traveller older than 2 years is allowed 1 item of carry-on luggage up to 6 kg. Maximum dimensions are 55 x 40 x 23 cm. On all flights after 1 April 2016, travellers 2 years and older are not allowed checked baggage; this is not included in travel expenses. You can purchase additional checked baggage when making your reservation at My Corendon or with the Contact Center. *Baggage may not be heavier than the 23 kg limit. **Passengers are allowed to check a maximum of 1 item of luggage. ***The item of luggage may not be larger than 158 cm. Does your checked baggage weigh more than you booked in advance? You can purchase additional checked baggage at the airport. If the total weight of your baggage is exceeded, an excess baggage fee will be applied at the check-in desk. Charges are € 40 - € 100 (depending on the destination) per one-way trip. Excess baggage may be refused. I am flying with Azur Air Germany. What are the baggage regulations? You are allowed up to 20 kg checked baggage free of charge. Please consult thebaggage rules. I am flying with AlMasria Universal Airlines. What are the baggage regulations? You can also book checked baggage upon departure from and arrival at a Dutch and / or Belgian airport. Note: It is only possible to purchase 20 kilos. If you make a booking on our website, you can immediately book 20 kilos. If you want to book the luggage at a later time, please contact the Contact Center. I am flying with Sunexpress. What are the baggage regulations? I am flying with BH Airlines to Bulgaria. What are the baggage regulations? I am flying with Atlas Global Airlines to Antalya, Turkey. What are the baggage regulations? You are allowed up to 20 kg checked baggage free of charge on charterflights of Atlas Global Airlines. I am flying with Turkish Airlines o Istanbul, Turkey. What are the baggage regulations? You are allowed up to 30 kg checked baggage free of charge on flights of Turkish Airlines. Please consult the baggage rules. I am flying with Anadolujet (sister company Turkish Airlines) to Antalya, Turkey. What are the baggage regulations? You are allowed up to 20 kg checked baggage free of charge on charterflights of Anadolujet. I am flying with Pegasus to Turkey. What are the baggage regulations? I am flying with Tailwind to Turkey. What are the baggage regulations? I am flying with Onur Air to Turkey. What are the baggage regulations? Download the most current regulations regarding EU security rules for carry-on luggage. You are allowed to bring liquids and gels in packages up to 100 ml. These packages may only be transported in a clear plastic bag. Each person is allowed one clear, re-sealable plastic bag with no more than 1 litter content. Thermos flasks (empty or full) are prohibited. Can I take my tax-free purchases on the airplane? All liquids, such as alcohol and perfume, purchased at EU airports or on board EU airlines are permitted if the liquids have been packaged and sealed in a bag in the shop or on board the aircraft. You must be able to verify that the liquids were purchased on the day of the flight, and the seal on the bag must be unbroken. If you are making a stopover or layover at a European airport and are required to leave the aircraft for a short period of time, you must take your carry-on luggage with you. You are not permitted to leave it in the aircraft. Tax-free liquids purchased at an airport outside of the European Union will be confiscated at European airports. Even when they are sealed. This also applies to purchases made on board of non-European airlines. Please take this into account. Can I bring medicines and baby food in my carry-on luggage? You are always permitted to take medicines and baby food that you need during your travels in your carry-on luggage. However, you must be able to prove that you need the medicines during the trip. Which items are always prohibited in both carry-on and checked baggage? Traveling abroad is often a reason to buy presents and other articles. You are recommended to know which rules apply. You are permitted to import a maximum of € 430 of goods purchased outside of the EU to the Netherlands tax-free. If the total amount is higher, you are required to pay import duties and VAT. Limits exist for tobacco and alcoholic beverages. If you exceed those limits, you must pay import duties, sales tax, and taxes. Some items are not allowed to be imported under any circumstances, such as endangered species of animals and plants, drugs, and weapons. If you do, these items will be confiscated. You also risk paying a steep fine. For additional information, go to www.douane.nl. It is prohibited to import imitation brand articles to the Netherlands. Customs will confiscate these items and you will be fined. Brand articles are imitated in order to piggyback on the success of the brand article (intellectual property fraud). Items commonly imitated are shoes, clothing, handbags, expensive watches, illegal copies of cds and dvds, and perfumes. If traders abroad offer you so-called brand articles at extremely low prices, you can almost always be sure this is illegal trade or fake items. It is prohibited to take and import imitation articles. However, it is permitted to take a very small amount of imitation articles for personal use. The amounts of certain categories of imitation articles you are allowed to take with you (according to guidelines by the Public Prosecution Service) are listed below. 3 watches, 250 ml perfume/eau de toilette, 3 music cds and dvds (only if they are different titles), no software and games, other goods (such as clothing and toys) 3 items/pairs. If the customs officer finds items exceeding the quantities for the category listed above, they will confiscate all items in that category and you will be fined. These exceptions only apply if you are a traveller taking the goods yourself. If imitation articles arrive in the Netherlands per post or courier, the imitation articles will be confiscated and you could face prosecution. The European Union (EU) is actively addressing money laundering, as well as the financing of terrorist and other criminal activities. Mandatory declaration, as stipulated in the Cash Regulation, is one of the measures implemented by the EU to achieve this. Any person traveling to or from the European Union with 10,000 euro or more in cash must declare this at Customs. Tourists going on a cruise, airplane crew members: anybody entering or leaving the European Union with 10,000 euro or more in liquid funds must declare this with Customs. A suitcase full of money is the most obvious example of liquid funds. However, all other cash equivalents not payable to a specific person (payable to bearer) in included in mandatory declaration requirements. Typical examples are shares and stocks. Mandatory declaration applies to every person transporting liquid means, regardless of its owner. Somebody transporting a package of shares on behalf of a third party, is also required to declare it. Those transporting liquid assets are responsible to know their value in euros. That sum is more easily made for bills of euros than for US dollars or a stack of shares. People who transport liquid asserts will usually prefer to keep them close in carry-on luggage during the trip. They want to avoid the risk that a fellow passenger mistakenly takes their bag or suitcase from the luggage carousel. Or even worse, that the bag or suitcase is delayed somewhere along the way. This does not change the fact that liquid assets in carry-on luggage must also be declared. In other words, mandatory declaration applies to liquid assets in all baggage. Travelers are required to declare immediately on entering or leaving the EU. Those who do not satisfy mandatory declaration requirements, risk fines and/or jail terms. 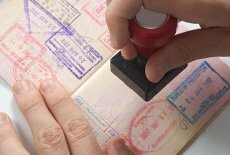 In addition, Customs may confiscate the liquid assets if the traveller is unable to immediately provide the required information. Finally, please be aware that in addition to mandatory declaration, additional rules governing the transport of liquid assets may apply in some EU countries. When planning your travels, be sure to take this into account. Additional Information www.douane.nl.